Whether it's 8 months or 80 years from now, if an embroidery thread comes loose on your jacket that you purchased from us, we'll fix it for you free of charge. If we can't fix it, we'll replace it. We keep all previous orders on file forever, so we can recreate any embroidered order exactly as it was before. Please note: This guarantee applies to embroidered items only, where stuff4GREEKS did the embroidery. 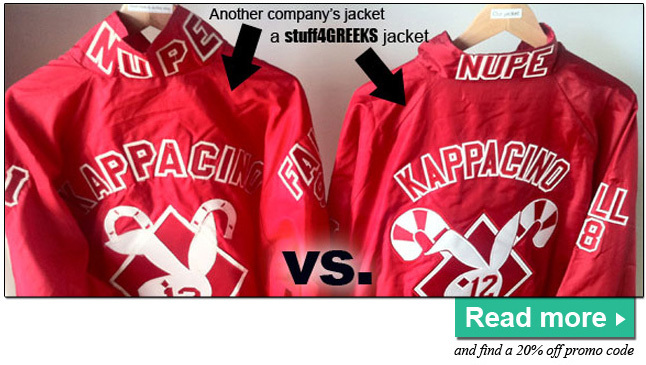 All letters and designs that were sewn on or embroidered by stuff4GREEKS are covered for life. 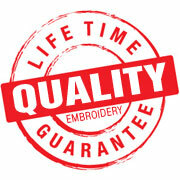 This guarantee covers the actual embroidery itself, not the garment that was embroidered on. • Abuse, accidents, misuse, or alterations to the product. • Exposure to the elements (sun, wind,water/moisture) and discoloration or fading over time. • Normal cleaning and maintenance. • Any damage to the garment that does not have anything to do with the embroidery. Take a closer look at our quality. Read this.